Exhausting and ridiculous celebrity Jared Leto is doing something suitably exhausting and ridiculous to promote the forthcoming new album from his alt rock band Thirty Seconds to Mars. Presumably because the LP is called AMERICA, he's decided to hitchhike across America. According to a press release, Leto will travel the country by "any means possible" for a week. These means include but are not limited to "trains, planes, automobiles, Greyhound bus, Lyft rides, bicycles, NASCAR pit stops and more." The method actor and musician has apparently been handing out genetic testing kits while he travels, in an effort to "further showcase what America is made of." He also appeared on The Tonight Show Starring Jimmy Fallon, complete with a classic hitchhiker's backpack. 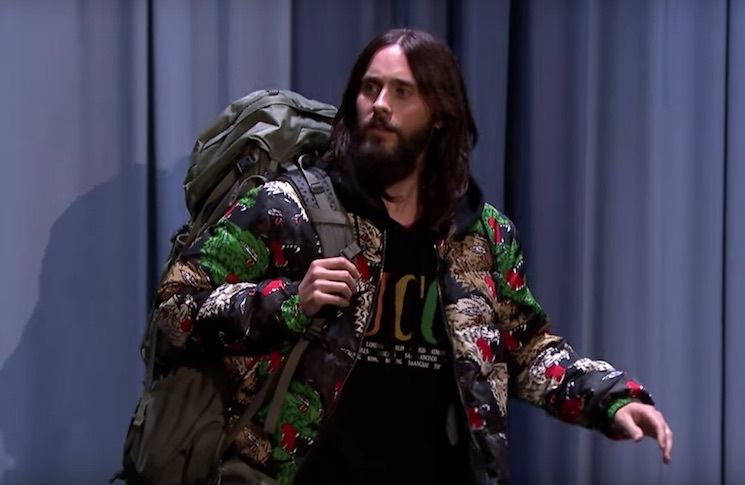 Watch the clip below, along with some social media posts about Leto's travels. AMERICA will be available on April 6 via Interscope. Thirty Seconds to Mars also have plans to tour this summer, though we're guessing the other band members will make sure Jared Leto is not in charge of planning transportation.